Ton Koopman conducts Juilliard415 and the Royal Conservatory of The Hague's Baroque Orchestra and Choir at Alice Tully Hall before the Holland trip. In December, Juilliard415 traveled to the Netherlands, the mecca of historical performance practice, as part of a collaboration with musicians from the Royal Conservatory of The Hague. The combined forces, conducted by Dutch early music specialist Ton Koopman, performed Bach's Mass in B Minor in three concerts, following performances in New York and Boston in November. Second-year master's harpsichordist Robert Warner chronicled his December 8. 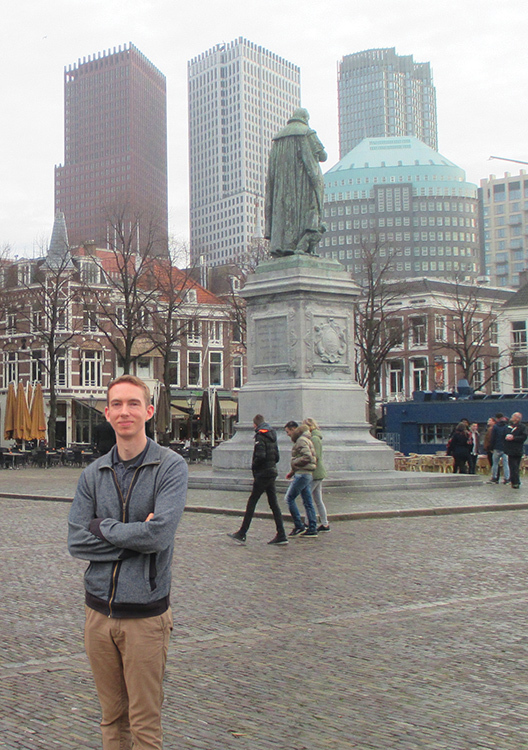 Robert Warner in the town square (Het Plein) of The Hague. 9am Fighting off jet lag, the Juilliard cohort drags itself downstairs for a free hotel breakfast. Compared to our rather abysmal introduction to Dutch cuisine aboard KLM Royal Dutch Airlines, the hotel's breakfast buffet is spectacular: eggs, pastries, cereals, fruit, coffee, and even (not joking) self-serve champagne. Fueled with copious amounts of caffeine and some bubbles, I'm ready to start my day. 10:30am The historic center of The Hague is a short tram ride from our hotel in the Beatrixkwartier, and so with our free morning, a friend and I set out for some sightseeing. First on our list is the Mauritshuis, a 17th-century mansion-turned-museum with an outstanding collection of Dutch Golden Age paintings (including Vermeer's famous Girl With a Pearl Earring). After perusing the collection, purchasing some postcards, and grabbing a bite to eat at the museum café (more coffee and a Pearl Earring Éclair), we explore the surrounding area. Noon The Mauritshuis is located on one end of the Binnenhof, a series of government buildings bordering the small lake where the city was founded in the 13th century. Most buildings are off limits, but Parliamentary debates are open to the public, and so we decide to take a peek at the inner workings of the Dutch government. Of course, not knowing the language, I have no idea what is being said, but a diagram shows which seats belong to which political party (there are many—including an animal rights party and a 60-plus party to advocate for senior citizens!). 2pm Dress rehearsal begins for our first concert in the Netherlands. Our venue is the Grote Kerk (the appropriately named Great Church) in the heart of the city. This proves to be quite a different experience from our last performance of this repertoire, at Alice Tully Hall. Our colleagues from the Royal Conservatory have clearly seen their share of ridiculously large churches, but for us the space is a bit overwhelming. As we accustom ourselves to the new acoustics, Maestro Koopman makes a few small adjustments and goes over some spots with his usual efficiency and directness. But we are now in performance mode, and so his focus shifts from the small details to the big picture. A piece like the B-Minor Mass requires a real commitment, and we are up to the task. 5:30pm On our own for dinner, I join some of my fellow musicians on a quest for a bite to eat. The food here seems insanely cheap to us, and I can't help imagining the horror our European colleagues must have felt upon visiting Juilliard the previous month and confronting New York City's food prices. We stumble upon a respectable looking sandwich shop and warm up with a hot meal. But for dessert there is no resisting the ultimate Dutch delicacy: a freshly made Stroopwafel McFlurry from the nearby McDonald's. 7:30pm Our concert begins. The church (which, as it turns out, no longer operates as a church and functions mainly as an event space) is decked out for quite a spectacle. At Tully, we were billed as performing Bach's Mass in B Minor. Here, our performance is billed as The Ultimate Messe (no pun intended, hopefully). V.I.P. service, catered appetizers, and a preconcert lecture precede the concert, which is professionally filmed and accompanied by a colored-light show. Perhaps a little overkill for the average stuffy American concertgoer, but if that's what draws in Dutch crowds then so be it: the concert sold out and was a huge success. 9:30pm With no intermission (the audience may not have great taste in stage lighting but they sure do have stamina), the concert lasts just under two hours. We finish off the wine at the reception and head across the street to a local tavern, appropriately named the Fiddler. Postconcert outings are a valuable if all-too-infrequent opportunity for us Juilliard students to get to know our colleagues from the Royal Conservatory on a more personal level. Fortunately, it turns out that they are as much fun to share a beer with as they are to share a stand with. Though the good company (and cheap drinks) make it tempting to stay out late, two more days of concerts lie ahead and a full night of sleep is called for. So, back to the hotel for some trashy Dutch late-night television and a well-deserved rest.